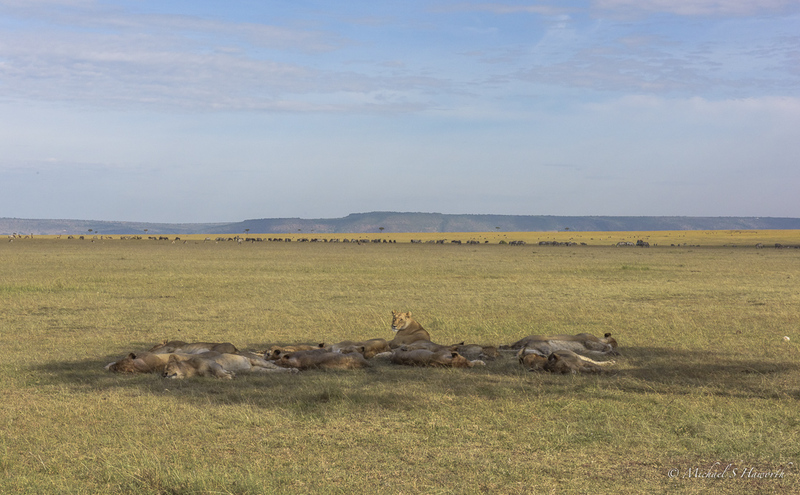 This is the last post from our Masai Mara trip with CNP Safaris in February. This is a period which is between the “small and big rains”, the latter coming in late March and April. The easiest way to get to the Mara is to fly by charter plane from Wilson airport in Nairobi . It is about a 45 minute flight. 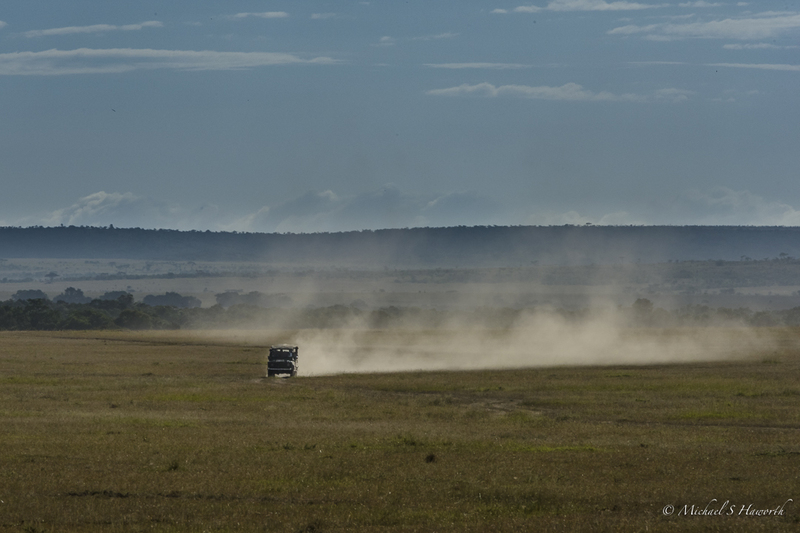 One lands on a gravel airstrip which is about a kilometre from the camp. 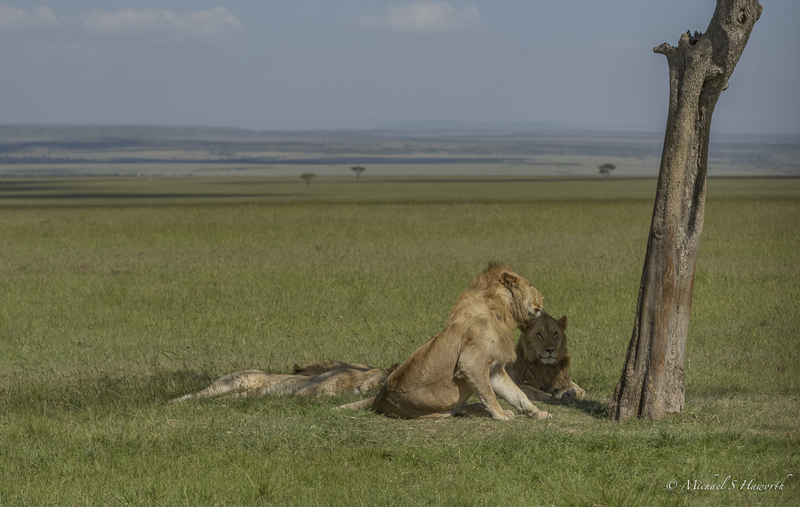 If you are lucky there will be pride of lions lying under a tree near landing strip. You are also likely to be greeted by buffalo, zebra, eland, and Thompson’s gazelle. The next image is a view for the camp while driving from the airstrip. 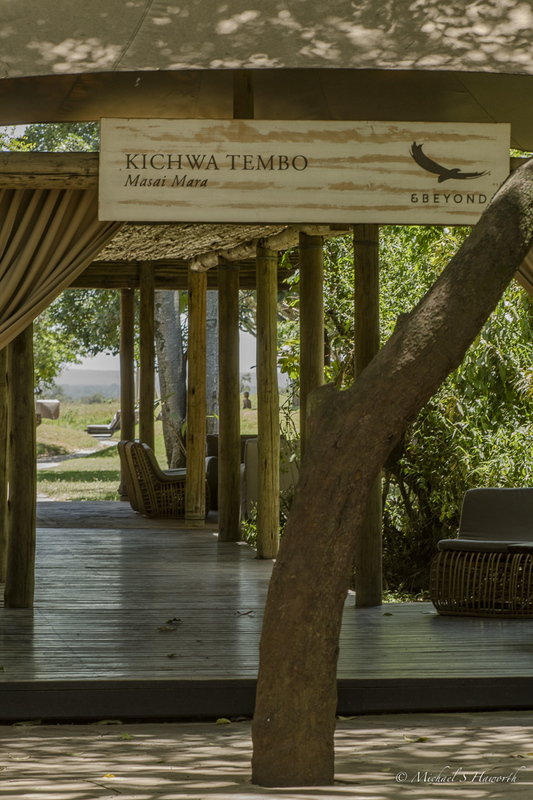 The Kichwa Tembo camp is sited on the edge of a riverine forest. It is cooler and there is rich birdlife in the forest. The reception looking east toward the dining area and towards the pool. Our tents were at the south end of the camp. From the front of the tent, the view beyond the electric fence was into thick elephant grass along the river. 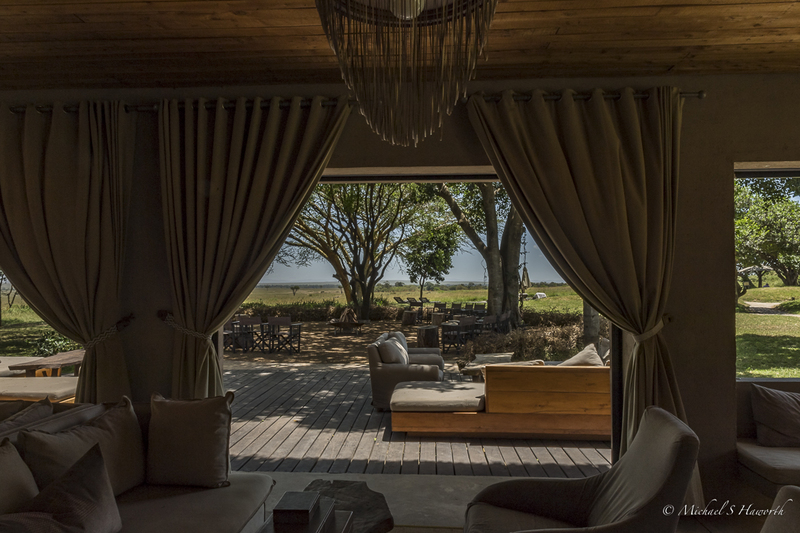 At night you could hear buffalo in the grass, hippos in the river and lions roaring. The inside of the tent was comfortable and perfect for our needs as we were out and about for most of the day. There was quite a voltage drop at the perimeter of the camp which complicated charging our camera and computer equipment. Nevertheless when you flop into bed at night, turn off the lights and just listen, you will hear a very busy nocturnal natural world outside. 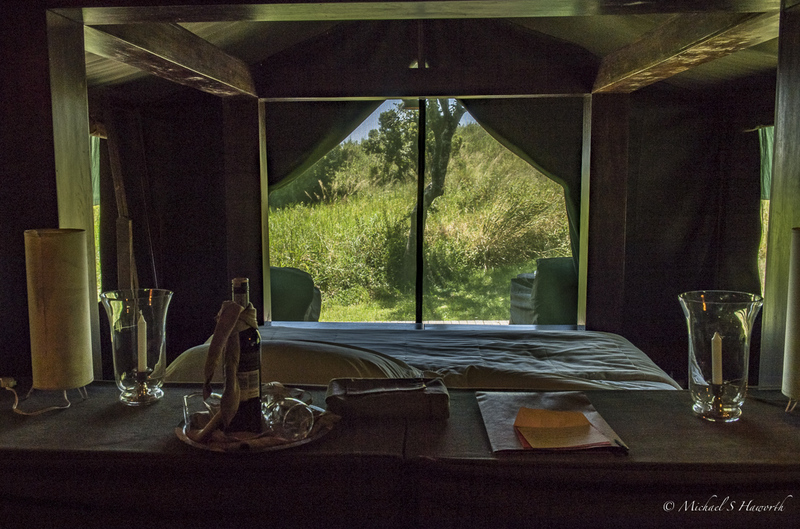 It is a wonderful feeling and even though it takes a night or so to adjust, by the last night you will waft to sleep comforted by all the bush sounds around you. Above the bar area was an open air lounge. 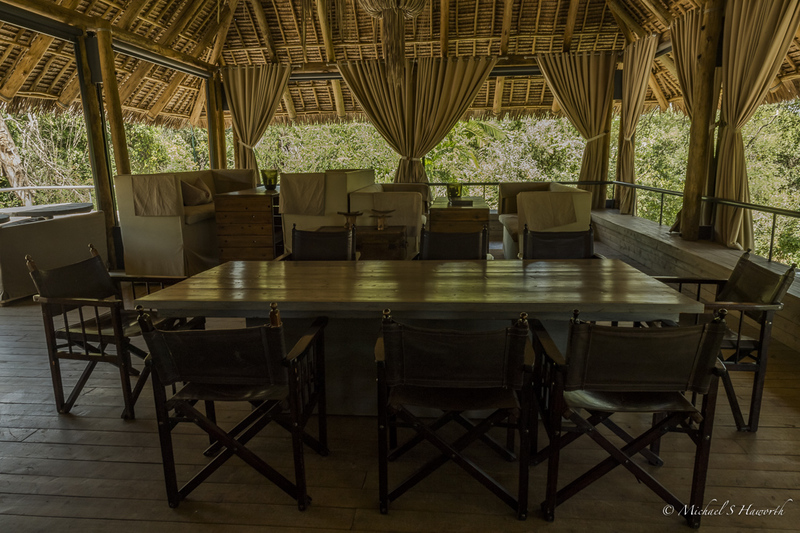 This was the view from that lounge looking down onto the boma where the Masai do their ceremonial dance around the fire at night. 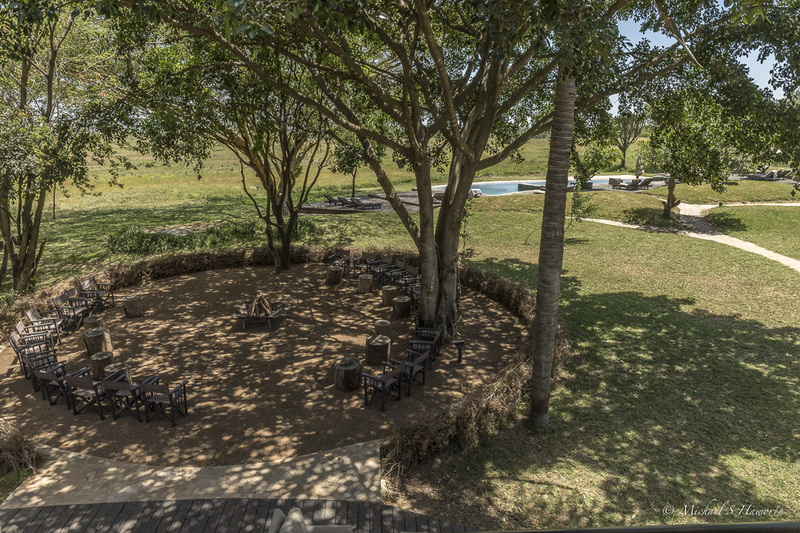 The pool looks out onto a large plain which stretches down to the Mara river. 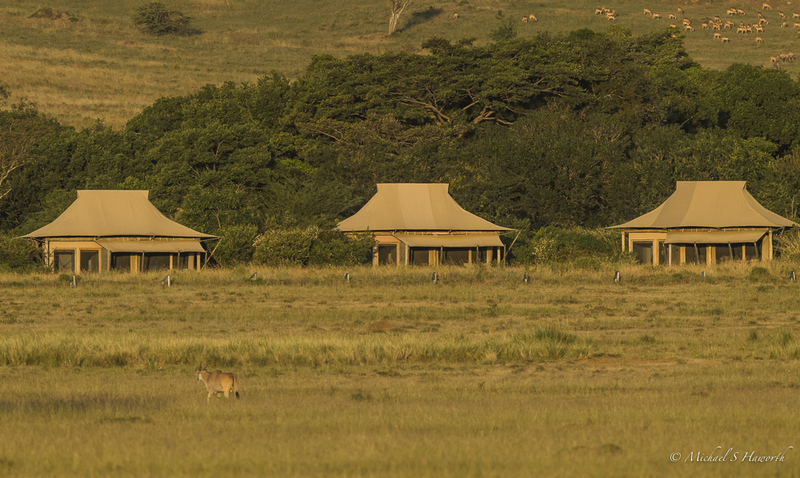 From the pool you can see everything from elephants, buffalo, zebra, giraffe and sometimes even lions during the day. In the lounge above the bar is where we did some of our image editing and discussed the days sightings. 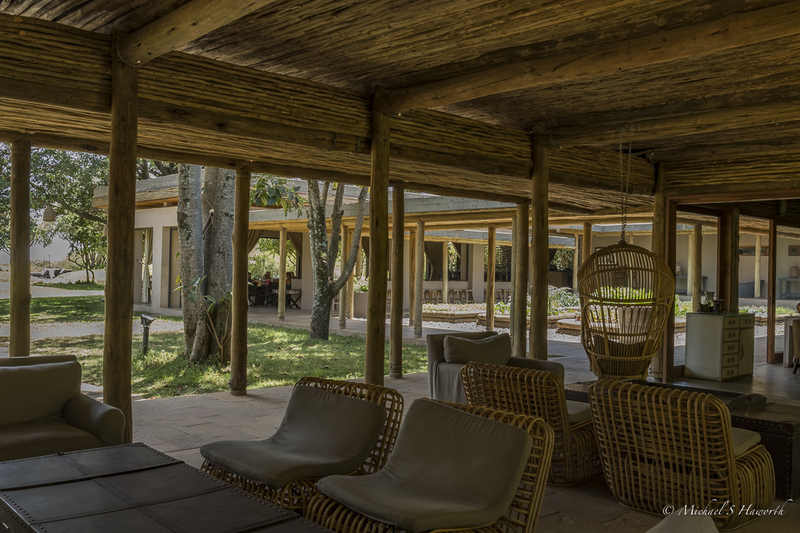 Looking out from the bar towards the boma and pool. This is a place of many stories and even taller tales are told. Discussions became animated over a few beers with faces illuminated by the light of the fire from the boma. At the start of each day we normally gathered at the dining area for a cup of coffee and a rusk with the aim to be out of the camp by 5h30. It took us about 45 minutes on the terribly rutted gravel road running on the outside of the reserve to get to the Mara North section. It was a very bumpy ride which was affectionately called an “African massage”. The aim was always to get the Masira gate by around 6h30. It was still dark at that time and once through the park gate we would start looking for the lion prides. Early morning was when the hot air balloons got going. Every morning we would see up to five hot air balloons drifting through the cool early Mara sunrise. 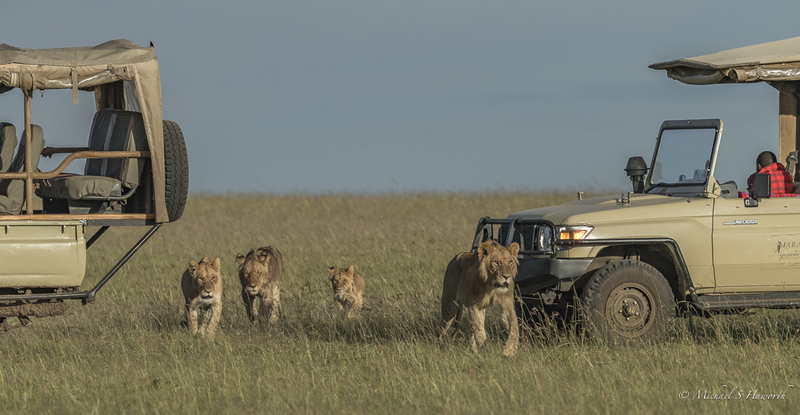 The guides from camps in the Mara North had radio contact and would tell each other where the predators were. This image was a guide taking his guests to see the latest predator sighting. 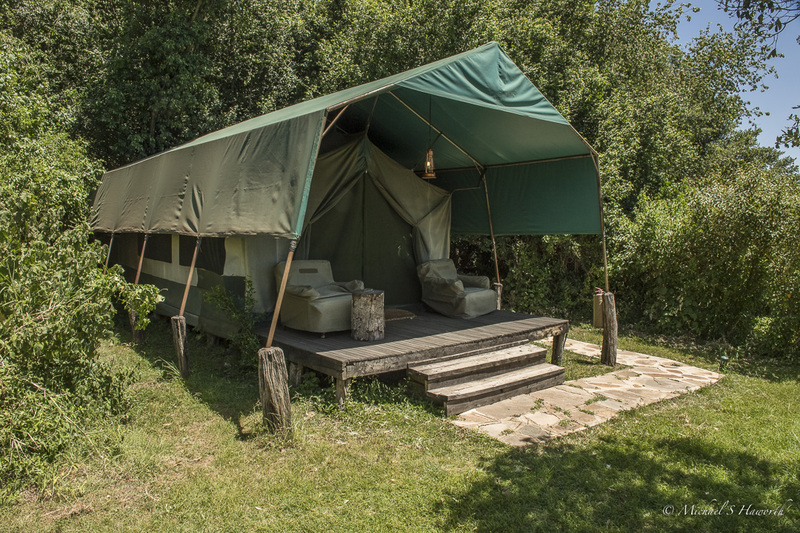 At lunch time we would stop in the “greenheart” forest next to the meandering Mara river. 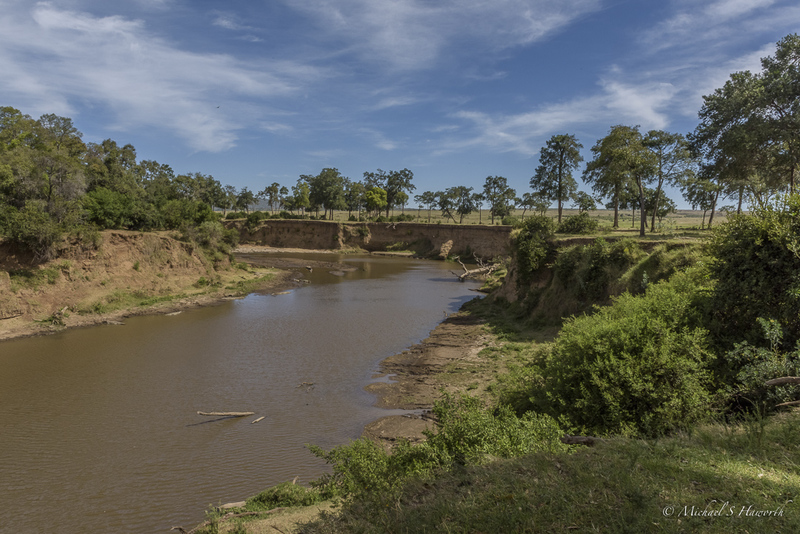 There were hippos and crocodiles in the river and in the afternoons the Olive baboons would scale down the steep river bank for a drink of water and to play. 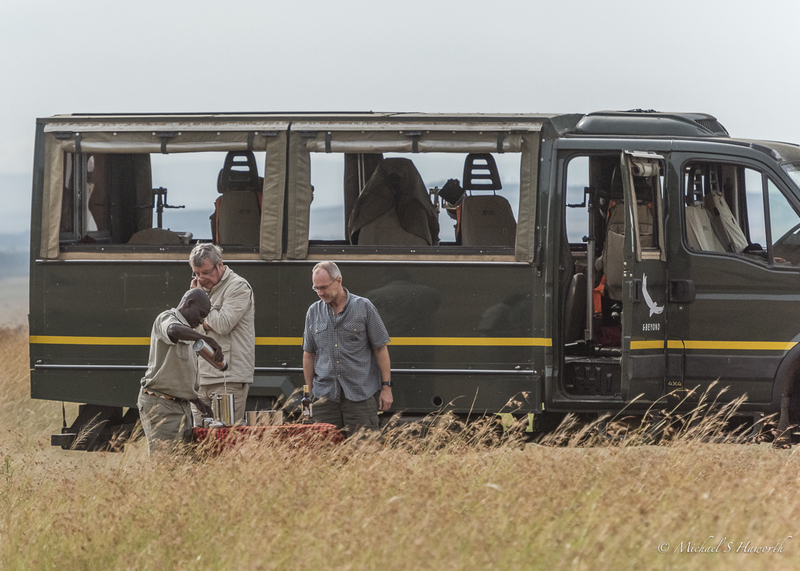 This is CNP Safari’s specialised photographic vehicle. It can accommodate five photographers with long lenses on a customised camera support system with swiveling chairs which give the photographer wide views and an ability to photograph from both sides of the vehicle. Late in the afternoon below the Oloololo escarpment, this was the view looking onto the Masai Mara plains. 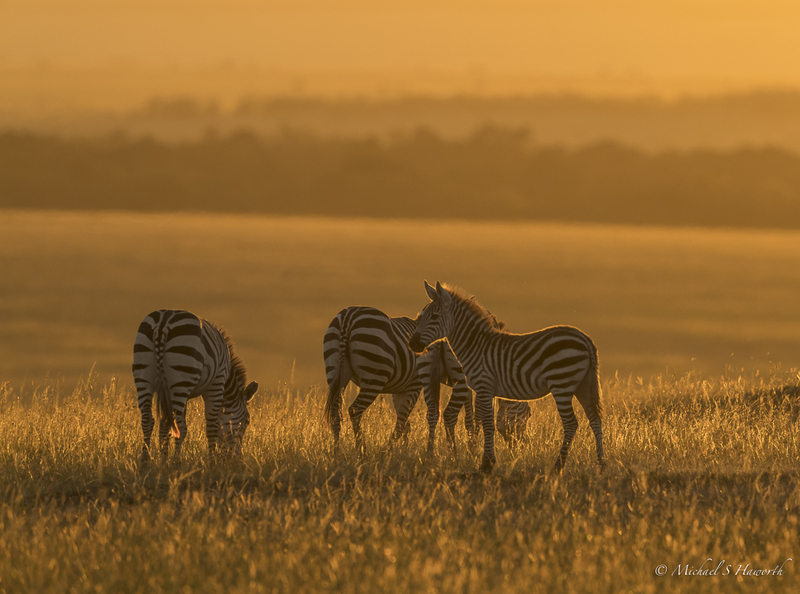 Dawn in the Mara North section with a soft warm morning light backlighting a few zebra. There were times at a predator sighting when there could be as many as 15 vehicles. It did not seem to bother the lions. There were other times when we were the only ones at a lion sighting. 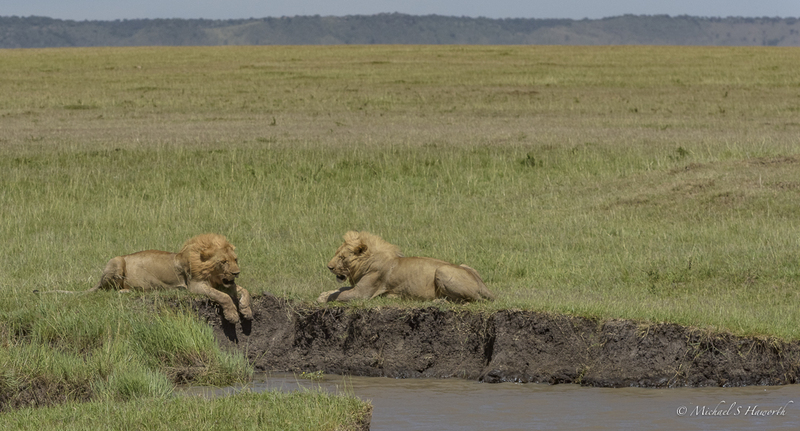 This was a new coalition of four young male lions who looked to be moving into the area for a pride take over. 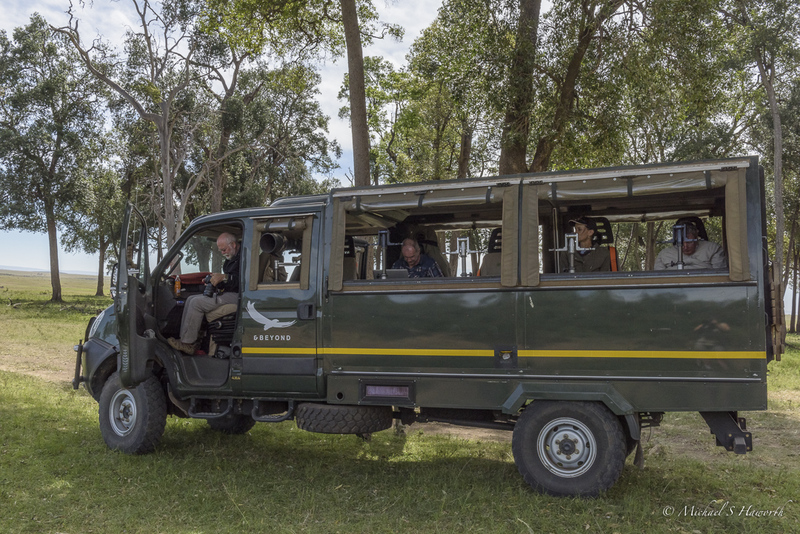 Lou Coetzer, our guide and professional photographer, and the owner of CNP Safaris, taking a few images of his guests in the specialised vehicle during a coffee break. Two nomads struggling in the heat late in the morning. There were no trees nearby to lie under so they chose the next best thing, a large pool of water in a drainage gully. 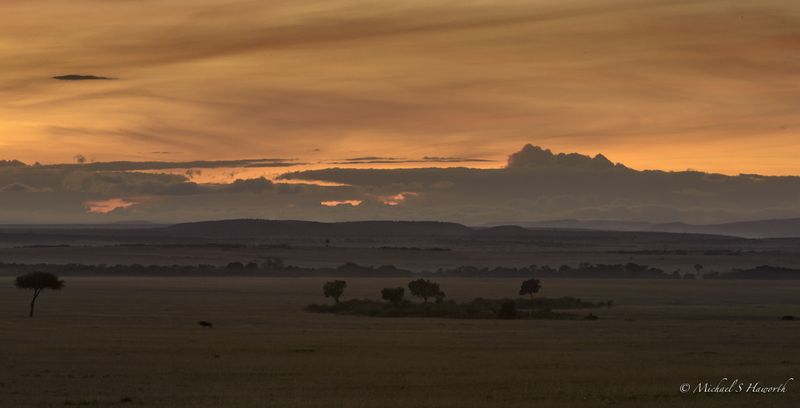 Another image looking to the east as the sun was rising behind the horizon in the Mara North. Two of my long-standing photo buddies, Duncan Blackburn and Les Penfold receiving some welcome mid-morning coffee from our guide and driver Akatch. 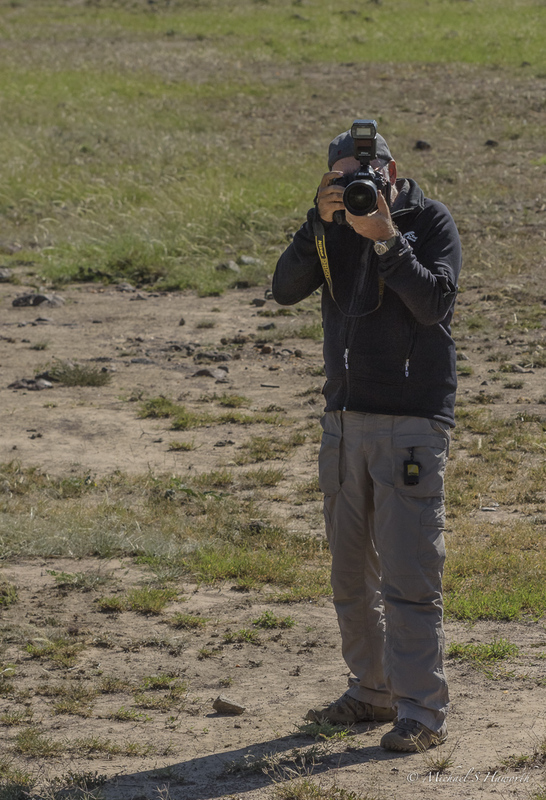 Both are excellent and experienced wildlife photographers. While we were waiting for action at a sighting we would chat sharing camera settings, and we had many interesting discussions about life and the universe, sprinkled with wicked humour. Late in the morning when the sun had risen quite high, the lion pride would seek the shade offered by a balanite tree. Usually one lioness would keep watch while the others slept. 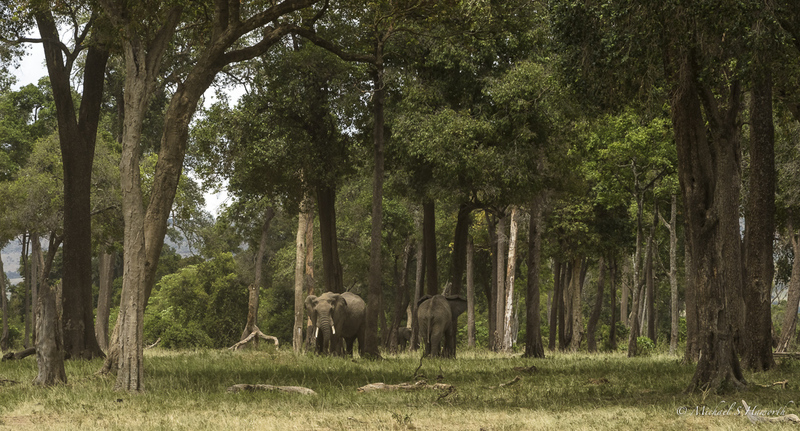 A very peaceful scene of elephants enjoying themselves in the “greenheart” forest. They would eventually move out of the forest and make their way towards the swamp around midday. February is a superb month for predator photography. The herds have passed so the predators have to work harder to feed themselves. There is still plenty of game and birdlife on the plains. This time of the year offers fewer vehicles and the grass is low so photography on the plains is much cleaner. 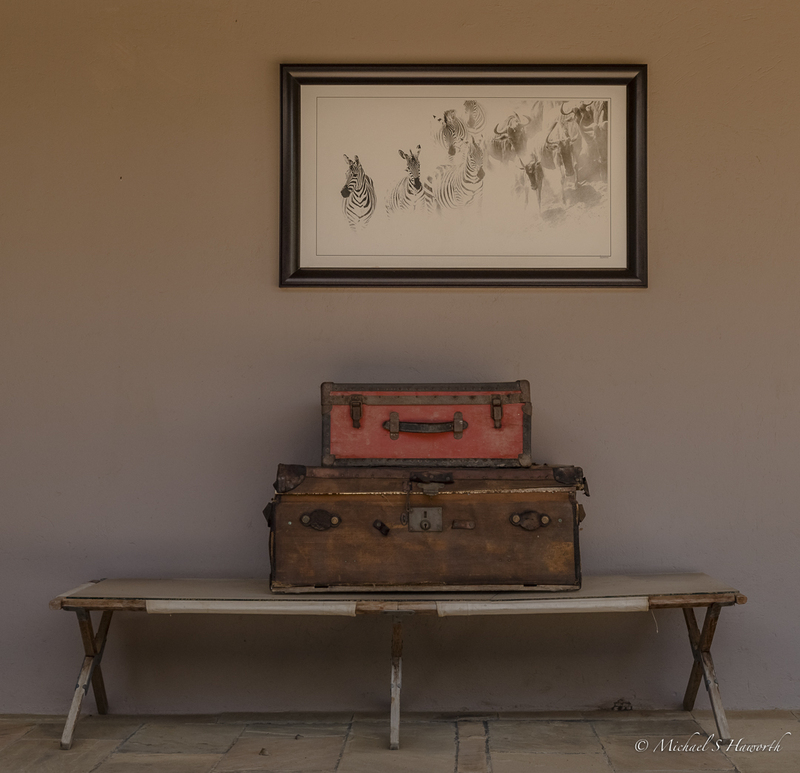 A special thank you to Lou Coetzer and CNP Safaris for a wonderful photographic safari. We were privileged to have some exceptional wildlife photographic opportunities. This is one of the most remarkable and productive photographic destinations I have been privileged to wander through. Love the personal approach in this blog Mike! So much part of the experience and memories.